PRESS/YOUTUBERS: Interested in a Review Copies or an interview? Click Here for the Press Kit/Contact Info! Have you ever played an open world game and thought "if only I could build something here?" Or a city builder and wanted to drive around and interact with your creation? Or even a building game and thought "if only these buildings would come to life?" Build sprawling cities with either the over 50 prebuilt buildings, or build your own in-game! Make amazing structures with over 15,000 types of blocks in over 100 categories. Earn cash from either completing missions, crime, or managing a real estate empire. Destroy and vandalise areas with explosives, weapons and tanks. Ride a wide range of vehicles including cars, a tank, helicopters and even a rideable shopping trolley! The entire world is block based, so you can create and destroy everything. Various non-cube construction blocks, including ramps, stairs, steps, allowing you to build things like pitched roofs and ultimately more realistic looking buildings. 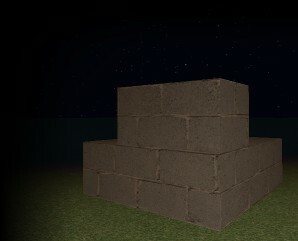 Custom player-built buildings can be saved as templates, and be placed like normal buildings. These are synced across a network, so you can do this in multiplayer too! Unlock reward buildings, such as the Cemetery, the Town Hall and even a Space Program! Work together with other players to unlock them faster! 10 hats for your character to wear, also wearable body armour. Weapons are customisable too! Attach weapon mods to weapons to change their appearance and behaviour. Make shotguns explosive, make your pistol armour piercing or your SMG scoped!